What are Cyclone Separators? And how do Cyclones operate? A cyclone or cyclone separator is a conical shaped device, which is used to remove and separate particulates from air, liquid and gas. This is achieved by using a high speed rotating airflow- a method which is commonly referred to as vortex separation. Here, the pattern of airflow can be likened to that of a helix or tornado, where the airflow begins at a wider top and ends at a narrow bottom. When air, liquid or gas is fed into a cyclone chamber, lighter particulates which weigh less than the air molecules themselves, are easily manipulated and thus carried along with the rotating airflow. However, heavier particulates, which are much denser, are said to have too much inertia and are therefore unable to follow the tight curves of the airstream. As a result, the path of heavier particulates remains uninfluenced by the high speed of the rotating airflow and they instead continue to travel in a straight line. This causes them to collide with the outer walls of the cyclone chamber, breaking their path and resulting in them falling to the bottom of the chamber, where they are then collected for removal. Static cyclones don’t have any moving parts, which makes them inexpensive and relatively easy to operate. However, this means that they can only be adjusted by mechanical modifications and their operating efficiency is particularly low for separating small particles. Unlike static cyclones, dynamic cyclones operate by a rotating impeller, used to increase the flow of air liquid or gas. This provides dynamic cyclones with the flexibility to produce large flow rates, increasing the impeller rotor speed, with a much higher efficiency of separation than conventional separators. So, how do cyclones separate lighter particulates from liquid, air and gas? Due to their conical shape, as the airstream gets further towards the bottom of the cyclone and its torado-like curves get tighter, it becomes harder for even small and fine particles to follow the tight curves of its airstream. Cyclones are commonly employed in the cement industry and thus regularly come into contact with materials which are prone to building up. What common issues can affect cyclone separation? Cyclones can successfully separate and remove particles as small as 15 g/m³, which have been released by commercial processes, such as; power plants, food manufacturers and chemical producers. Therefore, whilst Cyclones can therefore be considered as an incredibly effective pollution control device, for this to occur, they must be operating at their maximum working efficiency. There are a number of cyclonic separation issues which can cause the efficiency of their operation to be inhibited, with the most common problems being material build-up on cyclones, Impeller blockage and structural damage as a result of this. To understand how cyclonic separation problems could affect your business, it’s therefore imperative that you understand how these issues occur in the first place, to ensure that you can put measures in place to to prevent cyclone problems from reoccurring in the future. When particulates are expelled from the cyclones airstream, if the vertical walls of the cyclone chamber have an insufficient amount of friction for the particles to slide down, they will instead slide against each other. Materials which are particularly prone to this behaviour are those with a sticky, moist or tacky consistency, such as those used in the cement & grinding industry, where cyclones are commonly employed. When particles slide against each other, this causes them to coagulate and form surface build-up. Material build-up is an issue for cyclones because it can have a detrimental impact upon the speed of cyclone impeller and subsequently the conical air stream, where its powerful speed is vital for the separation of solid particulates. Material bridging in Cyclones is caused when particles bind together to form an arch above the outlet of the cyclone, meaning that the cyclones airflow will become severely restricted. This occurs when friction on the inner cyclone walls causes the rate of flow to slow down, meaning that particles slide on themselves and bind together as a result. Aside from industrial cyclones relying heavily on having the correct airflow for efficient production and much of their operation resides on their ability to omit clean air, and thus acts as an pollution control device. Unless dealt with immediately, bridging can therefore become a serious issue, because if more materials build up above the outlet, this could not only restrict but halt the discharge of clean air completely. Cyclones are commonly employed in the cement industry and thus regularly come into contact with moist and sticky materials which are prone to collecting and building up around Cyclone impellers. However, not only does this behaviour decrease the efficiency of up-stream equipment operation, but it can also place a huge amount of stress on the impellers themselves. Increasing the likelihood of structural damage and wear and tear- if impeller blockages and material build-up aren’t resolved and prevented, this will lead to an increase in costly repairs, downtime and delays on production for your business. How can Acoustic Cleaners prevent cyclonic separation issues? Acoustic Cleaning is a non intrusive technology, which provides a long-term Cyclone cleaning and maintenance solution. That’s because, not only do Acoustic Cleaners efficiently debond compacted particles and remove blockages, but they also prevent them from occurring again. Primasonics Acoustic cleaners operate by creating a series of high energy and low frequency sound waves, which then penetrate material build-up with rapid pressure fluctuations. As a result, the compacted materials vibrate at different rates to their surrounding environments, causing them to debond from each other and dislodge from cyclone outlets, impellers and other surfaces. By using alternating frequencies, this allows acoustic cleaners to target particles that have different masses and which therefore travel at different speeds. 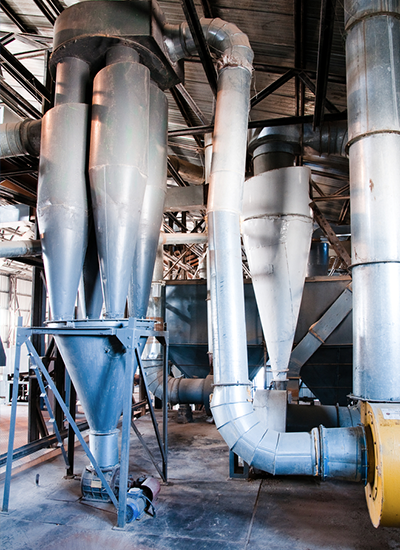 This allows Acoustic Cleaners to to tailor their frequency to deal appropriately with different silo and hopper issues. For example, as well as dealing material build-up and blockages they can also clean the Cyclones structure, thus ensuring constant airflow at all times. Primasonics Acoustic Cleaners are a non-intrusive technology, designed to not only solve cyclone cleaning issues, but prevent them.